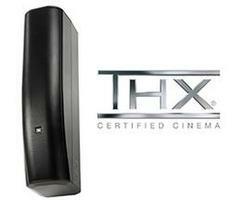 HARMAN’s JBL Professional announced this week that its CBT 70J-1 column loudspeaker and CBT 70JE-1 extension box are now THX approved, allowing the inclusion of the CBT 70J-1 loudspeakers in THX-certified theaters. The CBT 70J-1 is a high-power, two-way line array system consisting of 16 high-frequency drivers and four high-power low-frequency drivers, all in a fully co-axial column loudspeaker, featuring JBL’s patented CBT Constant Beamwidth beam control circuitry. The vertical coverage of the loudspeaker is asymmetrical, sending more sound toward the far seats of the auditorium than the near seats. JBL says that when used as surround speakers, this provides a much wider “sweet spot” where the audience hears a similar amount of both left and right surround speakers. The CBT 70J-1 covers a wide horizontal angle of 150 degrees. The bracket allows for both vertical tile and horizontal swivel aiming. The CBT 70JE-1 extension box can be added to the CBT 70J-1, doubling the low-frequency output capability and extending the pattern control of the system down to a lower frequency.